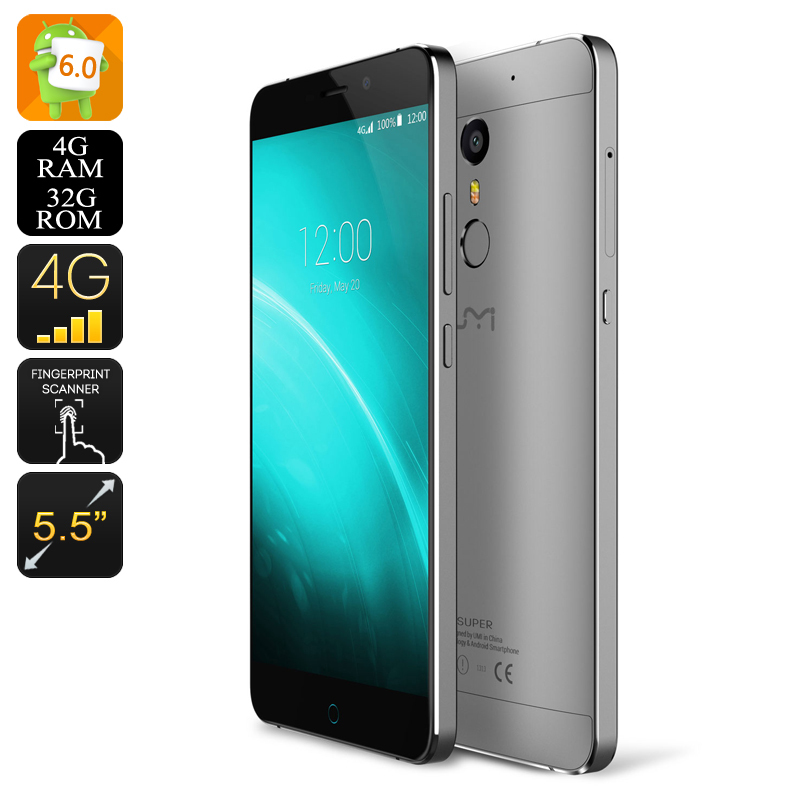 Successfully Added UMI Super Android Smartphone - Android 6.0, 4GB RAM, Octa Core CPU, Dual SIM, 256GB SD Slot, Quick Charge (Grey) to your Shopping Cart. The UMI Super is aptly named as with a whopping 4GB RAM, a Helio 2.0GHz Octa-core CPU and Android 6.0 OS it is lightening quick. Super speed, super performance and super powers this UMI Super has some impressive specs helping it perform a cut above the rest. Enjoy the latest games, breeze though multitasking and relax to stunning visuals with the UMI Super's powerful combo of Mediatek 6755 Helio P10 CPU running at 2.0 GHz, 4GB RAM and Mali T860 GPU all of which put this smart phone towards the top of the leader board for powerful Chinese Smart phones. The 5.5 inch display features Sharp's Low Temperature Polysilicon (LTPS), this allows higher definitions on smaller size screens due to its revolutionary approach. So that 5.5 inch 1080P screen really shines with bright vivid colors and depth for a richer viewing experience. To keep it looking better for longer the screen has been protected by Gorilla Glass 3 and has 2.5D arc glass adding to a greater aesthetical appeal. A huge capacity 4000mAh battery brings up to 20 hours of talk time, or plenty of gaming and video fun that will easily last the day. Taking advantage of Quick charge technology means the phones built in battery can be recharged and swifter speeds and only takes 3hrs for a full charge through the phones fast USB type C port that also allows for faster data transfer when required. Two SIM card slots allow you to user two numbers on different networks for better coverage and easy command of both work and personal contacts. however with the shared micro SD card slot they can't be both be used with your the extended 256GB of memory. With all this power it's a good job the phone has 32GB or internal memory which should be plenty for all your games, movies photos and media entertainment but just in case you need to add more there's a micro SD card slot that can support a staggering 256GB of external storage. Excellent mobile for this price! It is the second one purchased, so i'm really happy with it. Very good mobile phone! It is the second one I ordered. Very easy to operate, reliable and good looking. No bad point! My wife really enjoyed this mobile! It is an unbelievable mobile! Despite of his size, thickness almost as iphone and little bit heavier than my HTC, my wife is very satisfied about it. It is a really looking good mobile even for a lady. Fast delivery and very nice packing. Always satisfied to by from Chinavasion!